Life is grand and ever changing. My first year in Bellingham has been eventful and many personal goals have been reached. One goal that still needs to get checked off the list: finding my own place. The high cost of everything has me living with my brother longer than I anticipated. My brother was gracious enough to let me move in with him back in September 2010. His house is nice and roomy with plenty of space for both of us and the visiting nephews that come by every other weekend. Feeling optimistic I’ve kept my things in moving boxes all this time. However, this summer my college student son returned to live with “me” to find work. So now we are three. Then, this fall, my mom’s house sold. After being on the market for over six months she worried that it would never sell. When she did get a nibble things moved too quickly! Boom! She had 30 days to find a place to live. Her new home is all set up and ready to go …for February 2012! Now we are four. Four people, three generations all in three bedroom/two bath home with a basement. It happen as quick as a snap! 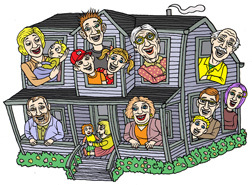 Apparently, multi-generational homes have become a nationwide trend. 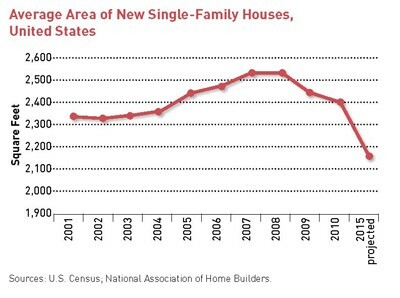 The high cost of living has many adult children moving back in with their parents. The newspapers call them “Boomerang Kids”. A recent article by National Public Radio states as jobs have disappeared and houses have been foreclosed on, many Americans are sharing space to save money. 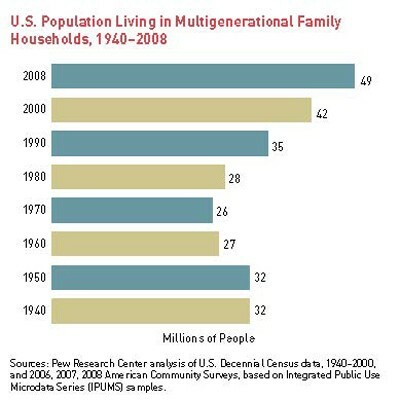 A new study by the Pew Research Center found the number of people in multi-generational households grew by 2.6 million between 2007 and 2008. So what are we, a boomerang family? My brother tells it like this: everyone suddenly needed help and he was the only one with a lifeboat! Well put. So for various reasons here we are. Four people, (seven when the nephews are over), three generations, all under one roof. So what’s it like you ask? We have issues much like the ones I remember as a kid growing up except EVERYONE is now an adult. Its hard to keep track of whose turn it is it to do the dishes with our work schedules. We have to stagger shower time so we don’t run out of hot water, and the labeling of the food has started! Sounds stressful. At times it is. The saving grace is that we don’t see each other very often. Space. We need our personal space. Space is a commodity. We are saving money and expenses by being together but, guess what we don’t like it! I’m starting to understand the reason why most families in America are spread out over the states. I’ve family all over the place: Aunts and Uncles in Minnesota, Maryland, Arizona and Hawaii, cousins in Texas, Oregon and Illinois. Don’t get me wrong, we love each other, but from a distance. Lets be honest, American’s in general love their independence –from each other! I understand now why people buy 5 acres and put their house in the middle- so they don’t have to share their fancy mustard with anyone. It’s my mustard dammit! I worked hard for it and I don’t want to share. Living together at elbows length has reminded me how selfish I’ve become… over mustard. Why? This is a temporary moment in time that should be treasured, I keep telling myself. Soon we will all be back in our own spaces and perhaps missing each other. You know those short moments of having a conversation over a cup of coffee at the kitchen table. Multi-generational living is all that, and a bag of chips! …Oh, um, that’s MY bags of chips by the way… see my name there written in sharpie?